Used to be there was a “right way” to get your work out there; radio, TV & print. 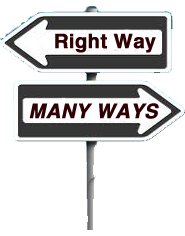 Today there is no right way—there are many ways; social networking, blogging, videos, podcasts, webinars, spamming, tweeting, texting, crowdfunding, etc. The thing to do is try them all—give them all a fair chance to work, give them all 100% effort. In time you will downgrade the ones that don’t work and bolster the ones that do. Truth is, having the choice of so many outrageous methods of marketing gets your work “out there” so much further then the “right way” ever did.